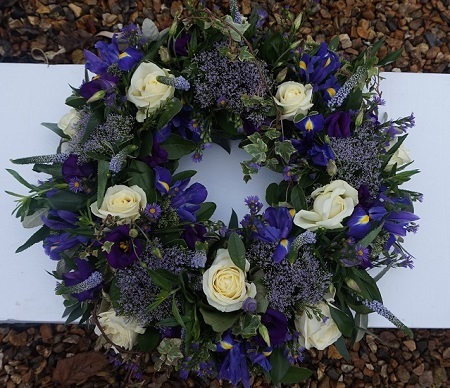 At Sarah Coxon Floral Design we offer two wreath designs, the Based wreath and also the mixed flower wreath. The Based design is based in white Chrysanthemums, and is edged in hand pleated ribbon in a colour co-ordinating waterproof ribbon. The spray of flowers on top of the wreath is raised above the Chrysanthemums and includes a beautiful selection of Roses, spray Carnations and other flowers to complement the design. It is possible to change the white Chrysanthemums for yellow or pink flowers. The mixed wreath is full of flowers which have been thoughtfully selected to complement the design. Usual flowers which may be used are Carnations, Roses, Chrysanthemums and Spray Carnations. Both wreaths are arranged in water retaining foam (oasis) to ensure maximum freshness. Our flowers at Sarah Coxon Floral Design arrive fresh from the Dutch auctions every day so you can be rest assured we are using the best quality of flowers available. If you would like to choose a colour scheme, please state this in the special request box. Alternatively you are most welcome to leave it to us to select the colours for you.